Sri Lanka is a tropical island found in the Indian Ocean just southeast of India. It is popular with tourists due to its beautiful beaches, historic landmarks, verdant forests and discount shopping, all within an hour's drive of each other. In an unexpected bonus for the traveller, the relaxed island atmosphere of the country makes for relatively light demands when it comes to travel etiquette. The nation has a rich history and fascinating culture. Some of the world's best tea is grown here - remember that Sri Lanka used to be called Ceylon. It's also an excellent place to purchase clothing, gemstones and fine china, all at fabulous discounts. The local residents are friendly, eager to help, and even more eager to practice their English. Sri Lanka is a largely undiscovered getaway located at the southern tip of India. Unfortunately, the Sri Lankan people have labored through years of civil war, as Tamil separatists in the northeast fight for an independent state. Just as peace was taking hold, portions of the coastline were devastated and uncounted lives were lost in the mega-tsunami of December 2004. Therefore there is a great deal of need among the people of Sri Lanka, so when you have an opportunity to tip, you should tip generously. You'll find that meals in Sri Lanka are generally much less expensive than most Western countries, especially when you travel outside of Colombo. So generously tipping your waiter will ensure not only an excellent service, but will actually make a little difference to them. 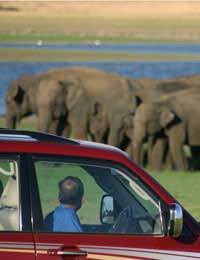 The same goes for any drivers or guides you hire to facilitate your Sri Lankan adventures. The predominant religion of Sri Lanka is Buddhism. As in many Buddhist countries, there are a number of astonishingly beautiful Buddhist temples open to foreign visitors. What every tourist should keep in mind is that these temples are actually sacred places of worship and devotion in addition to being an attraction. If you attend a house of worship, wandering through, talking loudly and laughing you snap photos from every angle can be quite trying, so you should try to keep the impact of your presence to a minimum. In the interest of maintaining good foreign relations and maintaining proper etiquette, try to respect the local residents to the same degree you would want to be respected at home. Travel etiquette tips for visiting temples in Sri Lanka include removing your shoes before entering. Men's legs and ladies' shoulders should be covered. Avoid wearing any type of revealing clothing. Women should not touch a Buddhist monk under any circumstance and should also never try to give anything directly to a monk. Don't try to photograph Buddhist monks without their permission. It's OK to take pictures of statues and images of Buddha, but it's not acceptable to pose in front of Buddha. Keep an eye on your children so that they don't try climbing on Buddha statues. When out shopping or sightseeing, you may see men holding hands or even embracing. However, in almost all cases, this behaviour means nothing more than friendship. Technically, homosexuality is illegal in Sri Lanka. But you will find that men are much more willing to display affection and friendship in a physical way. This is generally true throughout South Asia.There's another little bit of traveller's etiquette for Sri Lanka that you would do well to implement wherever you travel: don't use your left hand. Eating, giving or receiving with your left hand is considered inappropriate and mildly disgusting. In fact, even using your left hand to gesture or wave is simply not done. This is not due to any sort of discrimination against left-handed people. It's actually based on the general lack of toilet paper throughout the region and the normal method of cleaning oneself after certain bathroom functions! When in doubt, just leave your left hand in your lap. The best travel etiquette practice in Sri Lanka is to go with the flow, follow the lead of the locals, and enjoy everything this island nation has to offer.